Anyone can become a real estate investor. If I, a college dropout, can do it, so can you. I even wrote an ebook that explains step by step how to find, buy, and flip properties–houses, land, mobile homes–in Florida for big profits. You can use these same techniques to buy properties anywhere in the United States. 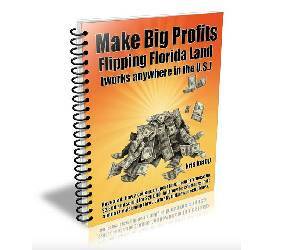 Find out more at Make Big Profits Flipping Florida Land. My interest in real estate has little to do with real estate. My interest in real estate has to do with what’s the end result of a good real estate deal–money and the freedom that comes from it, having the time to do what I want when I want. I’m interested in financial freedom. And learning how to make money with real estate allows me to be creative with my money and my time and, when the deal is beneficial, leads to financial freedom. This is how I bought a house for $2,000 dollars and sold it for $20,000 dollars. 7. Received an email from someone interested in buying it. He was a tech guy living in New Jersey. 9. I agreed to this over the phone. I had no idea what a balloon payment was, so I went to the library, got online and did research. 11. I searched online for how to set up the paperwork and the mortgage rate using online mortgage calculators, printed up a bunch of forms, and put together the contracts. 12. I set up the mortgage deal so the buyer made a downpayment of $2,500 and then made monthly payments of $400-something, with a balloon payment (final payment) of $16,000. 13. I signed and notarized the paperwork, made copies of it, then mailed it to the buyer. 14. The buyer got it, called me to say he’d got it. 15. I receive the payment for the downpayment in the mail. 16. The following months, I received the $400-something monthly payments. 17. On the sixth month, I received a check for $16,200 dollars. Hallelujah! I was running around the property saying “Praise God!” and “Thank you, Jesus!” It was a great day. I put the check in the bank. It cleared. To learn how to do this kind of deal, and even make money with real estate investing using no money of your own, grab a copy of my ebook at Make Big Profits Flipping Florida Land. ← Buy This Cottage Bungalow Fixer Upper for only $5,700 dollars!